Hannover Messe, the world's leading trade fair for industrial technology, was opened today. Hamburg, Northern Germany's innovation location, is presenting two of Germany's most innovative cutting-edge research projects: the automotive industry's largest functional component produced for Bugatti using 3D printing technology and European XFEL, the world's largest X-ray laser. 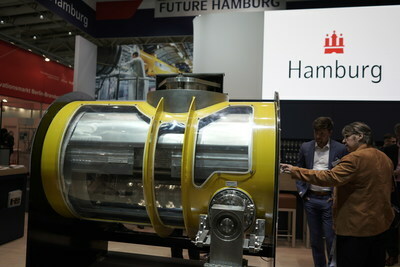 The "Future Hamburg" stand will be presenting state-of-the-art innovations until 27 April, with eleven exhibitors showcasing innovative projects from key technologies - the perfect opportunity to experience two spectacular projects from the area of technology transfer. At Hannover Messe, Hamburg-based Fraunhofer IAPT is presenting a milestone in additive production: with the completion of a 3D-printed titanium brake caliper, Fraunhofer IAPT and car manufacturer Bugatti have achieved a pioneering development. 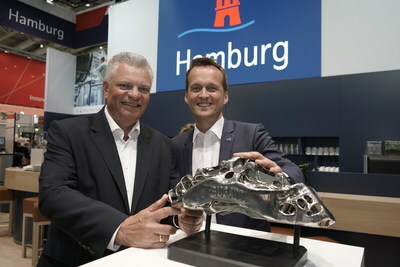 The caliper is to enter series production in Hamburg. Fraunhofer IAPT and its network of enterprises have made Hamburg a global leader in 3D printing. Meanwhile, Bugatti's super sports cars have placed the company at the forefront of innovation at the automotive industry's extreme end of performance. "3D printing is going to revolutionise industrial production. Hamburg is a global leader in scientific technology transfer, and we are expanding our position further. With short distances to stakeholders from politics and industry, Hamburg offers ideal conditions as an innovation location," says Prof. Dr.-Ing. Claus Emmelmann, director of IAPT. One of Europe's largest and most ambitious research projects is also featured at the Hamburg stand: European XFEL. Located in Hamburg and Schleswig-Holstein, the European X-ray Free Electron Laser - the world's largest X-ray laser facility - generates extremely intense X-ray laser flashes and is used by numerous international researchers. "Hamburg is well on its way to becoming one of Europe's leading centres for research and innovation," said Hamburg's Second Mayor, Katharina Fegebank. "3D printing and nanotechnology are cutting-edge fields that serve as key drivers for innovation and development in our city." Further information on innovations from Hamburg: https://future.hamburg.